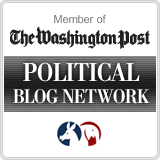 We've spoken previously about how Barack Obama is waging a war against the coal industry. Even though Candidate Obama openly told us that he aimed to bankrupt the industry, he has his toadie, former Ohio Governor Ted Strickland, traveling around the state making a fool of himself by insisting that Obama is actually a friend to the coal industry. Recently, ultra-liberal Senator Sherrod Brown (D-OH) joined Obama in attacking the energy source that provides 86% of Ohio's electricity. Brown had a chance to join other Senators, including other Democrats, in getting rid of the EPA's new Utility MACT rule, which is the centerpiece of the Obama's administration's self-declared goal of bankrupting coal plants and making electricity prices "necessarily skyrocket." 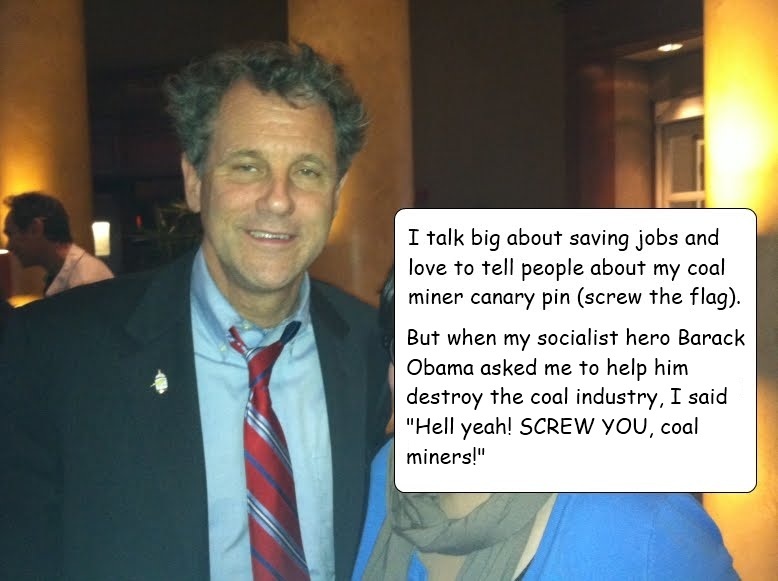 Sherrod Brown talks a big game about standing with miners. He even boasts about the coal miner's canary pin that he wears instead of a flag pin. But when it came time to cast a vote to protect the livelihoods of thousands of Ohio coal workers, he kicked them to the curb and voted to keep Obama's extreme new coal regulations. Sherrod Brown jumped into the foxhole, and eagerly became a soldier against his own state in Obama's war on coal. Also laying off workers was Ohio Valley Coal Co. of Alledonia, Ohio. General Manager Ronald Koontz attacked the Obama administration for a "'war on coal seeking to destroy the coal industry and the jobs of our own employees and the livelihoods of their families. "Unfortunately, for us, this is just the beginning of workforce reductions,"
Sherrod Brown proudly calls himself a "strong progressive." And shutting down coal plants is consistent with progressive values. Sherrod's extreme progressive ideals might fit in a state like Vermont, but not a center-right state like Ohio. I hope that a majority of Ohio voters join me in voting to elect Josh Mandel, and kick Sherrod Brown to the curb, like Brown is doing to the state's coal workers. Main reason cited for layoffs in the article (which you naturally glossed over)? Drop in demand for coal. What's been driving the drop in demand for coal in PA and OH? Natural gas fracking and Kasich's support of renewable, alternative energies like waste heat which can be used to drop the demands of steel companies at the expense of coal-generation. Yeah, that has more to do with it than mercury regulations that have yet to be finalized or put in place. THERE IS NO OBAMA WAR ON COAL!! HONEST!! perhaps the drop in demand has something to do with several coal-fired power plants being closed due to the new restrictions???? Well, since the restrictions actually aren't even in existence yet, Bryan, and are still being formulated, that's kind of a hard thing to attribute. The article notes that these industry leaders themselves say the most direct and immediate cause of these job losses is a loss of demand as coal is losing market share to natural gas. However, if you want to talk about policies, we can talk about how Josh Mandel and John Kasich support pro-natural gas fracking policies which is allowing it to crowd coal out of its marketshare. But in the end, if anyone is "waging war" on coal, it's the free market. And that's okay. Energy use should change over time. Coal was never guaranteed a permenent near monolopy over Ohio's electricity generation. Waste heat allows steel plants to help generate their own electricty, thus dropping the demand for coal-generated power. This makes the steel companies more efficient, lowers costs, and more competitive. Thus, allowing it to create more jobs, but at the expense of coal jobs. Modern, you arent this ignorant, are you? First energy has already announced the shutdown of FIVE of its coal plants, specifically because of the costs of conforming to new regulations. There are some free market forces at work as well, but the Obama administration is intentionally and artificially driving down the demand for coal. Sherrod Brown had a chance to stop it. He chose to side with Obama's war on coal. It's cut and dry. And so is Kasich and Mandel with his support of of natural gas fracking, and Kasich's support of the Strickland/Husted renewable/alternative energy portfolio, the competition is hurting coal. Heck, the article you cited in your post cited that as the main reason for these layoffs. The plants FirstEnergy is closing have an average age of 55 years, are small plants relatively speaking, and due to their age have major maintenance and efficiency issues. You also failed to mention that all but one of the plants had already been mothballed by FirstEnergy for reasons wholly unrelated to the EPA regulations. So FirstEnergy is closing plants that, for the most part, were already closed for most the year anyways. The reason you fail to mention it is because you refuse to educate yourself on an issue and just want to take partisan pot shots using talking points you're handed from the coal industry. By allowing the coal industry to pump mercury into our air, they get a competitive disadvantage to cleaner energy sources because the "savings" they reach by not installing modern equipment to filter their emissions are costs that are passed onto the public health. Costs the public doesn't have to bear when coal's cleaner competitors sources are used. For decades, the coal industry in Ohio has run ads touting the promise of clean coal technology. Now, they're refusing to live up to their own marketing. It's a legitimate public health matter, and a legitimate area for regulation under the Clean Air Act. And guess what, some energy company is going to have to meet the demand of the peak energy those plants occasionally made, and they're going to need workers to handle that demand. You can't just look at one side of the economic ledger, if you care more about the truth than blind ideological partisanship. I meant, a competive advantage over over cleaner air sources, obviously.